vinod Prakash Sharma, an expert on malaria, has bagged the Green Scientist Award 2001 for his work on bioenvironmental control of malaria. The Centre for Science and Environment (cse), a New Delhi-based non-governmental organisation, has instituted the award that carries a citation and a cash prize of Rs 1 lakh. 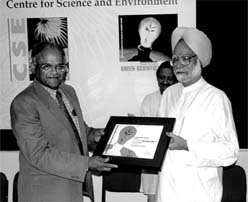 The award was presented by Manmohan Singh, former Union finance minister and a member of parliament at a function on March 31, 2001 in New Delhi. The award is the first of its kind. cse chairperson Anil Agarwal said that the apathy of the scientific establishment towards ecological security and environmental issues is one of the key reasons to institute the award. "The main aim of the award is to bring to the forefront any person who has done commendable work on ecological security," he explained. Speaking on the occasion Singh said: "There is an urgent need to invest in science for ecological security. This is, however, not happening in the allocation strategies." Agarwal said that Sharma's achievement lies in his successful transformation of a pesticide intensive malaria control method to one that is ecofriendly. Sharma has a long and distinguished career as an epidemiologist and malariologist, and is a pioneer in pushing forward techniques of ecofriendly malaria control. He is the founder-director of New Delhi-based Malaria Research Centre. His work is oriented towards involving communities to contain the spread of the disease rather than the large-scale usage of pesticides, which is still a standard procedure of the government's malaria control programmes. His work ranges from malariology, epidemiology and malaria control, entomology, genetics, vector biology and control of vector-borne diseases. It isn't that he invented techniques for bioenvironmental vector control -- they were there before he began his work. His major contribution has been to integrate these approaches. His work has been successfully implemented in many states in the country. Agarwal outlined the various environmental challenges facing India. "Environmental issues will be of prime importance during the 21st century and all of us have to learn from nature. We have to do away with the destructive technologies of the 19th and 20th centuries and move towards a system where we respect the geological patterns of nature," he said. In his acceptance speech, Sharma said that an issue like malaria is of extreme importance, particularly to India where 35 per cent of funds allocated by the government on health expenditure are spent on its treatment. "There is an increasing population pressure and, therefore, we need to focus our attention on long-term planning in the area of vector control," he said. cse director Sunita Narain said that the investment in the field of ecological security in India is negligible and whatever is allocated is spent in the most inefficient manner. Singh agreed with this and said that the government should take all possible steps to ensure that the funds are given to the right people and institutions. "We have to create a new world order where development is environment-based," opined Singh. He added that there is excessive bureaucratisation of the scientific establishment. The members of the jury who attended the meeting included R A Mashelkar, director general of the Council for Scientific and Industrial Research and Arun Kumar Attri, associate professor, school of environmental sciences, Jawaharlal Nehru University, New Delhi. Eminent scientist M G K Menon also spoke on the occasion. Malaria is responsible for the maximum number of disease related deaths in the developing world. It kills as many as 3,000 people across the world every day taking the death toll to one million annually. In India alone, over three million cases of the disease are reported every year. With the extensive use of pesticides like ddt (dichlorodiphenyl trichloroethane), the mosquitoes have developed a resistance towards them and it is becoming increasingly difficult to control malaria using the same. Moreover, these pesticides are dangerous to human health. ddt, in particular, is known to be a major health hazard and is banned in most of the developed countries. Unfortunately, India still uses ddt extensively for controlling malaria.